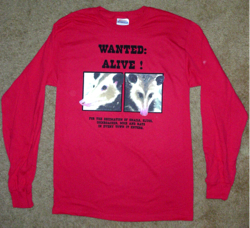 Seven ink colors blend to create the opossum face on this Hanes© 100% preshrunk cotton long-sleeve T-Shirt. Seven ink colors blend to create the opossum face on this Hanes© 100% preshrunk cotton long-sleeve T-Shirt. 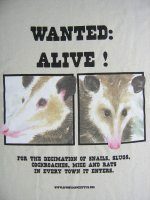 The red color provides a backdrop for the “Wanted Poster” format of the design. Reading “Wanted Alive!” “For the decimation of snails, slugs, cockroaches, mice and rats in every town it enters.” At the bottom is our website address. 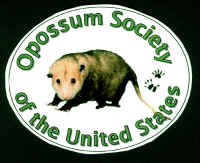 This t-shirt is a billboard for the benefits of having opossums in any neighborhood. Order now to wear and enjoy during the cooler evenings. Available in red only. Printed on front.